Warning: A very long post ahead.. proceed at your own risk !! 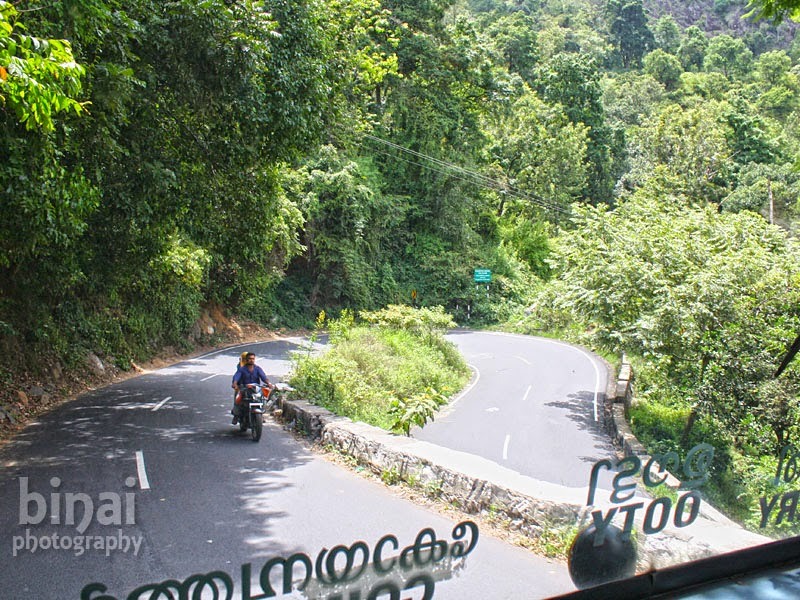 The second day of the KSRTC fans' ride covered two ghat sections - in fact, we were to go up and down one ghat section, then again go up and down the second - both belonged to the same Western Ghats. The route for the day was Sulthan Bathery - Pattavayal - Devarshola - Gudalur - Ooty - Coonoor - Mettupalam - Karamadai - Chinnathadagam - Anaikkatti - Agali - Attapadi - Mannarkkad (and further to Kozhikode and later to Thrissur). That is the route we travelled in the day - we did the distance is about 13 hours! The day started quite early for four of us - Sankar, Jayadeep, Ashwin and Yours Truly. Me and Jayadeep started from the hotel, where we stayed overnight, sometime around 0630hrs, while Sankar and Ashwin followed us a while later. The two of us walked from the hotel to the bus station - a cool early morning walk, clicking all the buses which came our way in the morning. But, where did the rest of the gang go? We decided to split up that morning - the four of us were leaving earlier than the rest of the gang - so what were we upto? We were heading to Pattavayal, where we would click our ride for the day - the Sulthan Bathery-Coimbatore Super Fast. So, what was the plan? 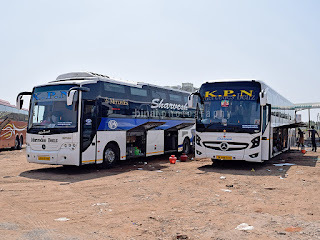 We were originally booked by the Sulthan Bathery-Coimbatore Super Fast - this is a unique service which starts from Sulthan Bathery in Kerala, and goes to Coimbatore in Tamil Nadu, via Ooty. 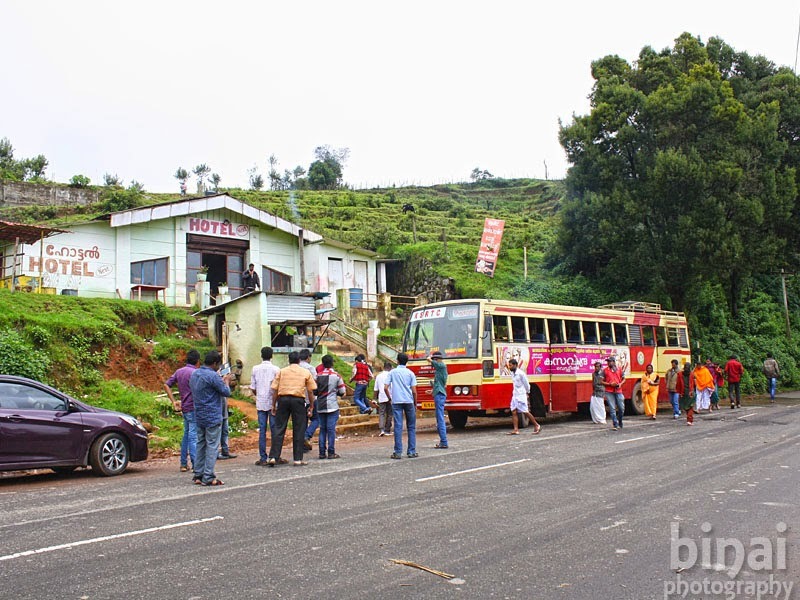 The bus climbs up the Nilgiris to reach Ooty, and then descends down to Coimbatore. A very unique service which began in the 90s. We were to take this bus from Sulthan Bathery to Mettupalayam. 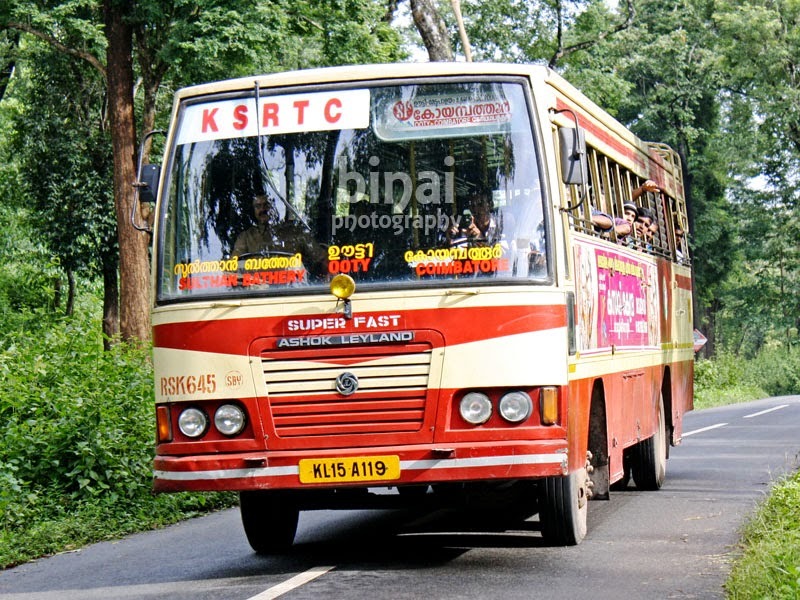 From Mettupalayam, we planned to take the Mettupalayam-Mannarkkad ordinary service of KSRTC - this bus travels via Anaikkatti, Attapadi, Agali, and descends down to Mannarkkad through the famed Silent Valley National Park. 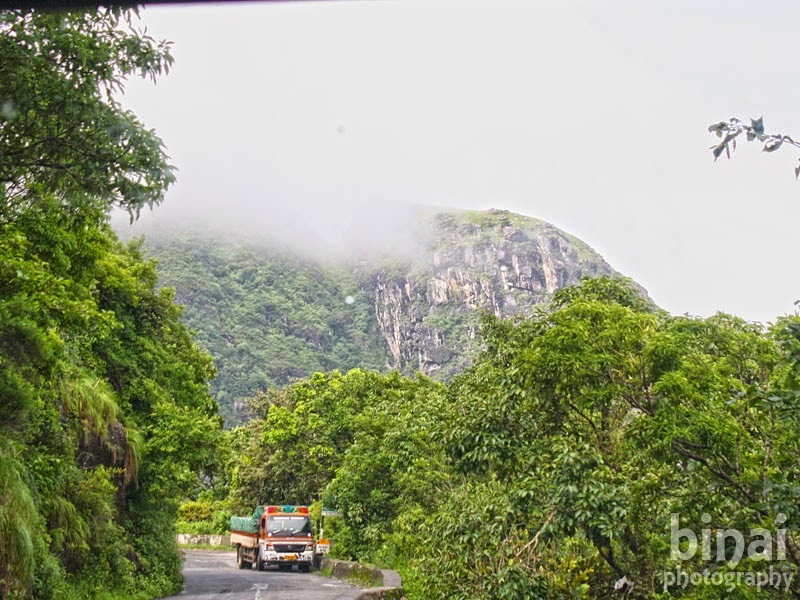 This means we would be travelling through some great ghat routes. Some of us wanted to take some photos of the Coimbatore superfast in the forest - with this in mind, the four of us split and took an earlier bus to take some pics of our bus in the forest. RAC587 of Bathery heading to Gudalur. After a quick tea and some light snacks at Sulthan Bathery BS, the four of us got into RAC587 of Sulthan Bathery - which was heading to Gudalur, via Pattavayal, Devarsholai. We grabbed seats at the front and got set for the journey. 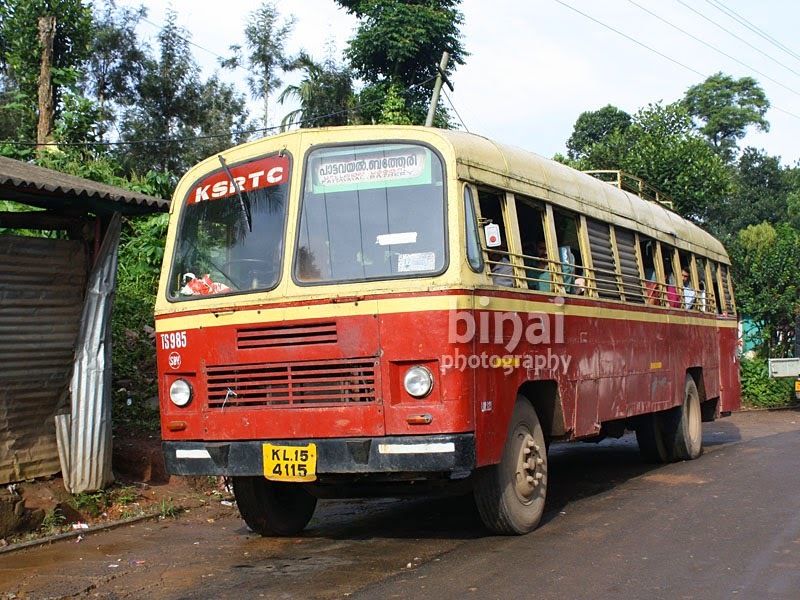 The bus first went to the fuel station (on the Muthanga route), filled up diesel for the day, and then headed to the Municipal BS in Sulthan Bathery, from where the service officially starts. The loads for this trip was very light - it was a Sunday morning as well. 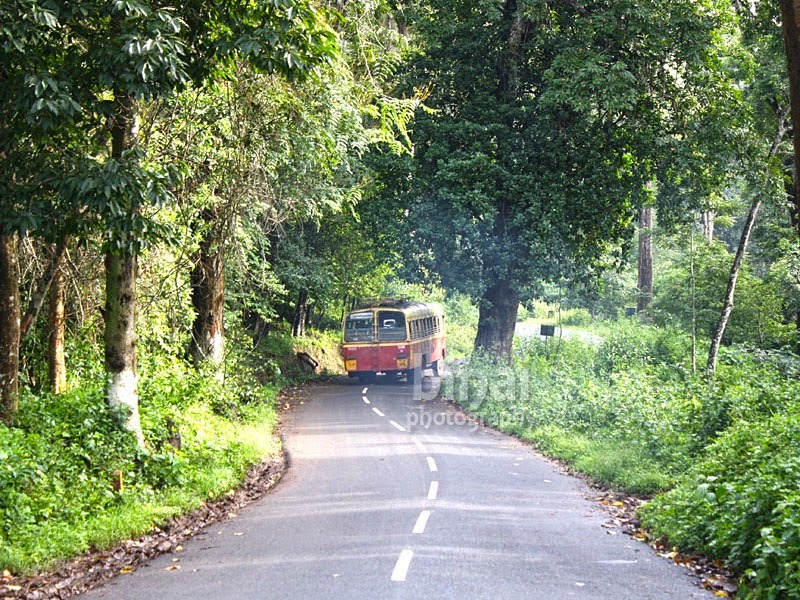 The journey to Pattavayal took just under 30 minutes from Sulthan Bathery - the bus goes through some semi-forest areas. 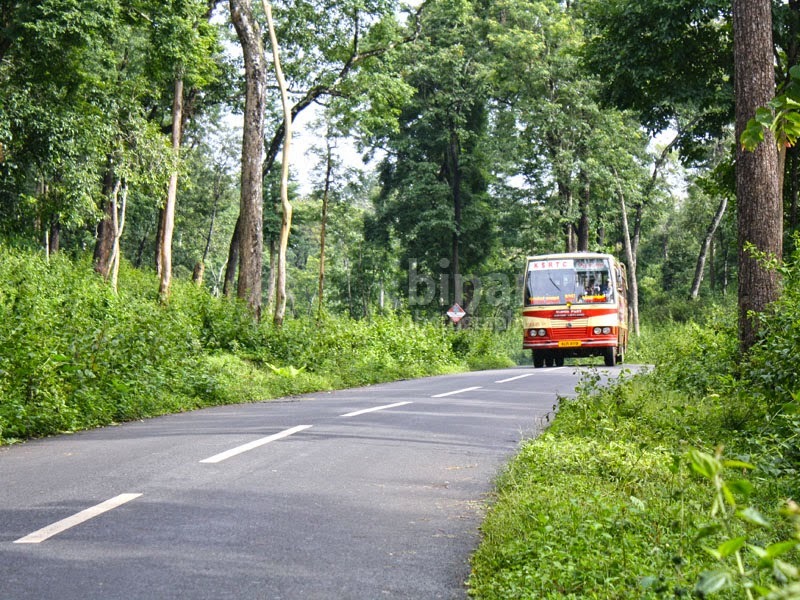 Its a narrow road, winding through thick forest-like areas. 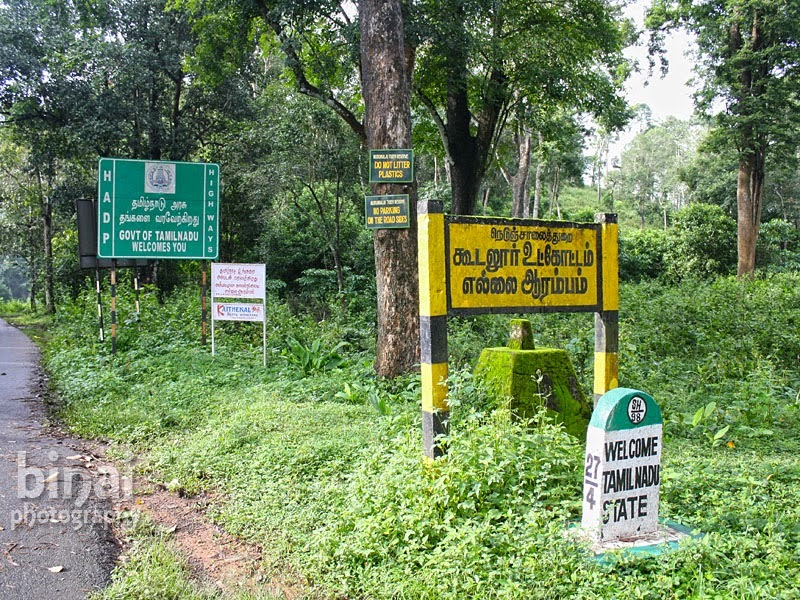 Pattavayal is in Tamil Nadu - the Kerala-TN border lies inside the forest. We got off the bus at Pattavayal - a small hamlet in the fringes of a forest. There were a couple of tea shops and a small "bus stand". We had initially planned to take photos standing in the town - but then our plan changed, and we decided to head to the forest checkpost. 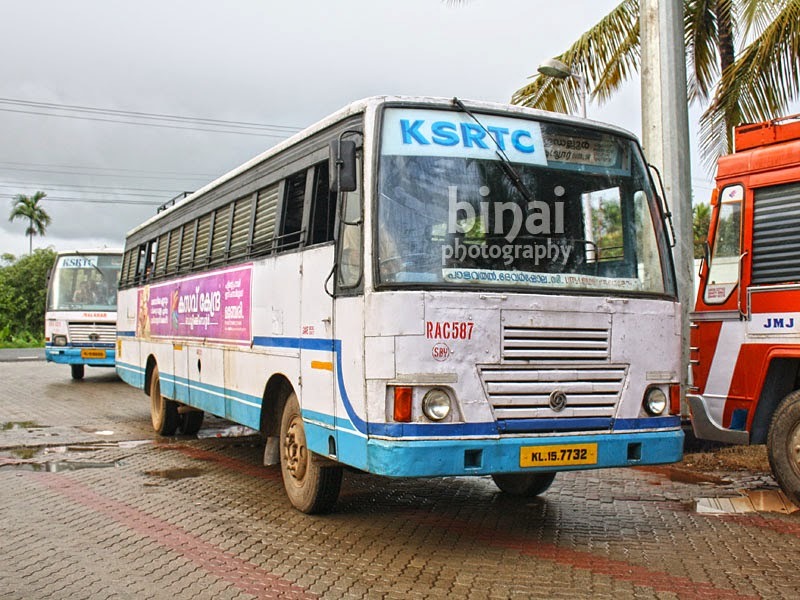 As if it was godsent, TS985 of Bathery was just about to start from Pattavayal to Bathery. TS985 goes away after dropping us in the forest..
Before getting into the bus, I got some delicious Pazha Vadas (Banana Vada, a fried snack made of White flour and Banana dough) from a tea shop - countryside specialties like these taste really awesome. 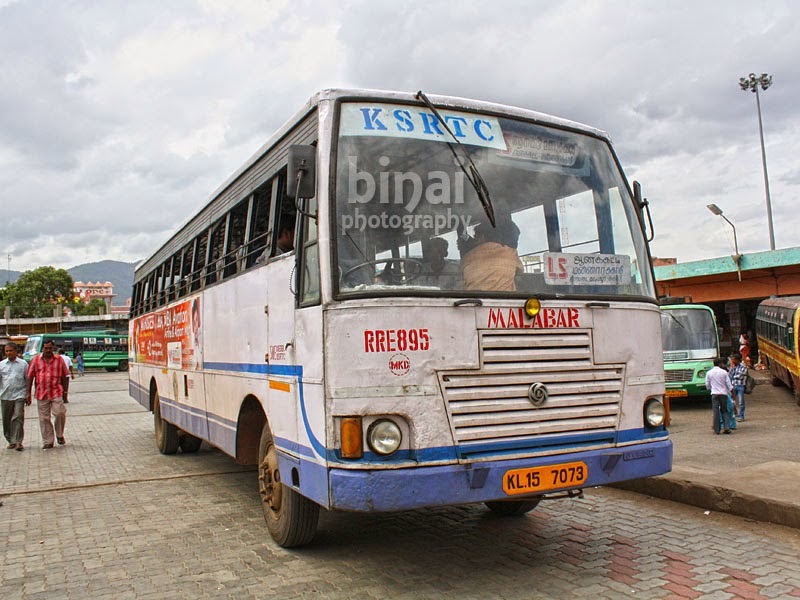 The ageing Leyland warhorse (TS985) dropped us at the forest checkpost at around 0820hrs. In the meantime, we called up the rest of the gang and we were informed that the bus had started from Sulthan Bathery. The guards at the checkpost did not permit us to take photos, or even stand there. They kept threatening us. Left with no options, we decided to walk to the Kerala side - which was under half a kilometre from there. It took us about 5 minutes to cover the distance, and we were back in Kerala by around 0830hrs. Our bus finally turned up at 0834hrs - our gang had pre-informed the crew that we'd be standing somewhere in the forest. The bus stopped to pick us. We had pre-reserved seats in the bus - so all we had to do was get in and occupy the seats. 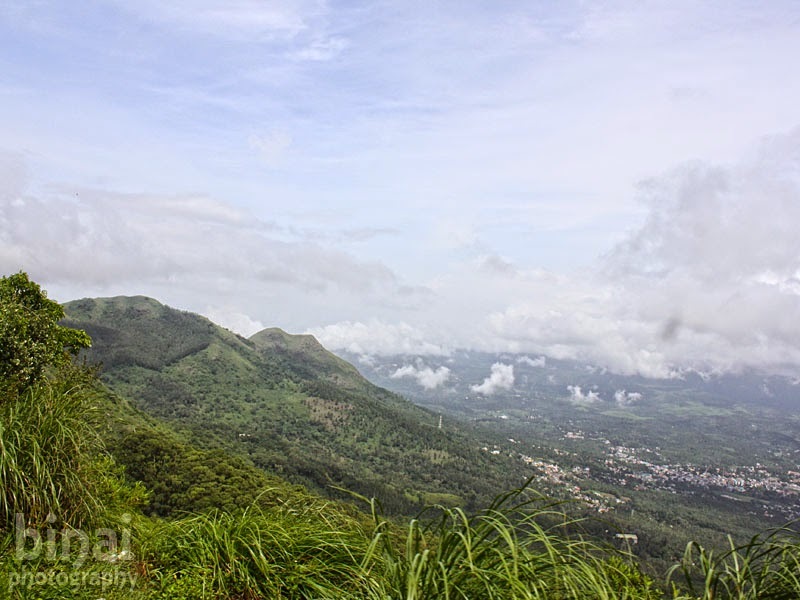 Its a winding route from Pattavayal to Gudalur. 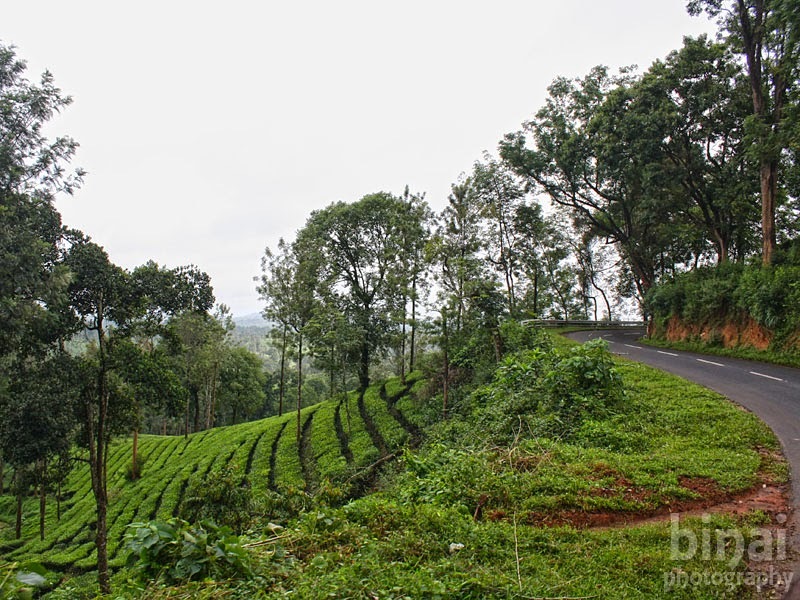 The section from Devarsholai to Gudalur is dotted with tea estates and coffee plantations. It was somewhat cold as we kept ascending the ghats. The bus was crowded for most of the time. Our first major stop was at Gudalur. We reached there around 0930hrs. The crew announced a short break and got off the bus. We spent our time clicking other buses in Gudalur, stocked up some snacks and water for the rest of the run. We left Gudalur at 0935hrs - beginning our ascent to Ooty. 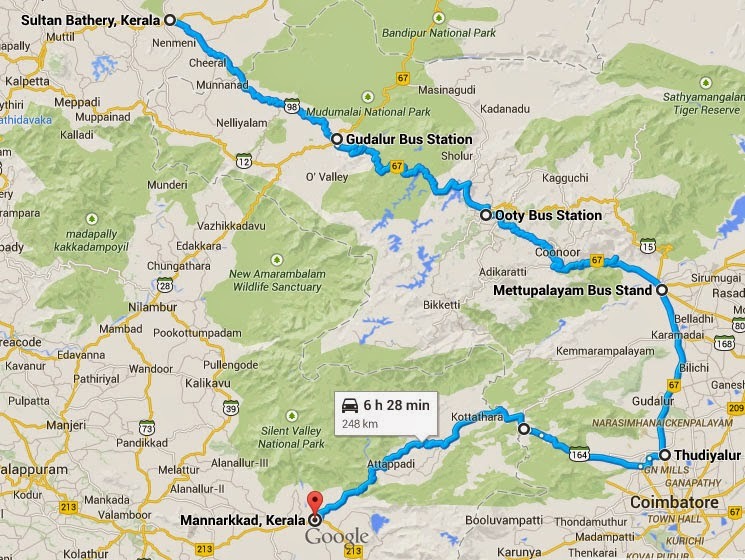 The Gudalur-Ooty section is also winding, but there no hairpin bends through the route. Mist covered most of the hills visible. It was a beautiful ride. We stopped for breakfast somewhere before Pykara at around 1030hrs - the restaurant was overpriced (like every restaurant where buses stop) and the food was nothing great to talk about. The breakfast break lasted about 20 minutes - it was a small hotel, and it took lots of time to serve all the passengers. The bus continued its climb after the breakfast stop. We were in Ooty by around 1150hrs - the bus took a short 3-4 minute halt at the bus station and then continued towards Mettupalayam. Seats emptied out a bit as we started off from Ooty. It is somewhat plains till Ooty - the road is twisty, though. The real ghats begin after Coonoor. 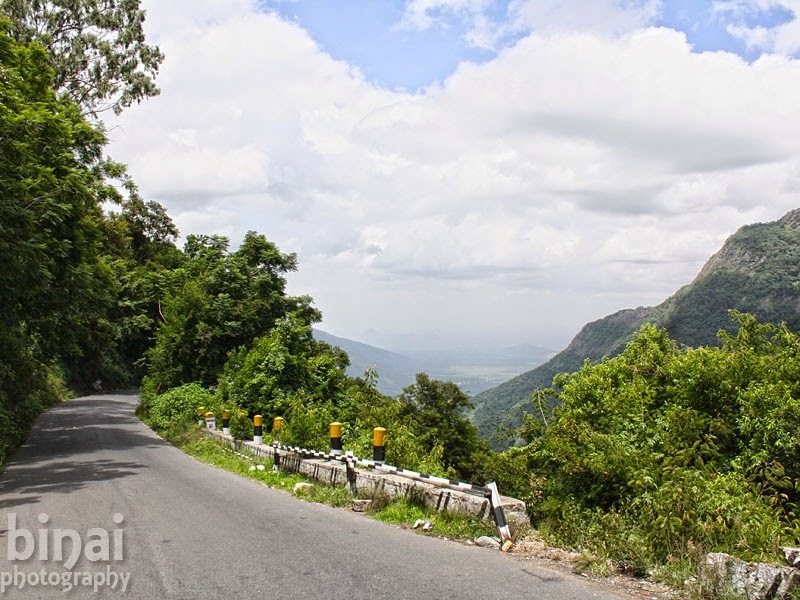 The section is known as Kallar Ghats and has 14 hairpin bends, lying between Coonoor and Kallar. 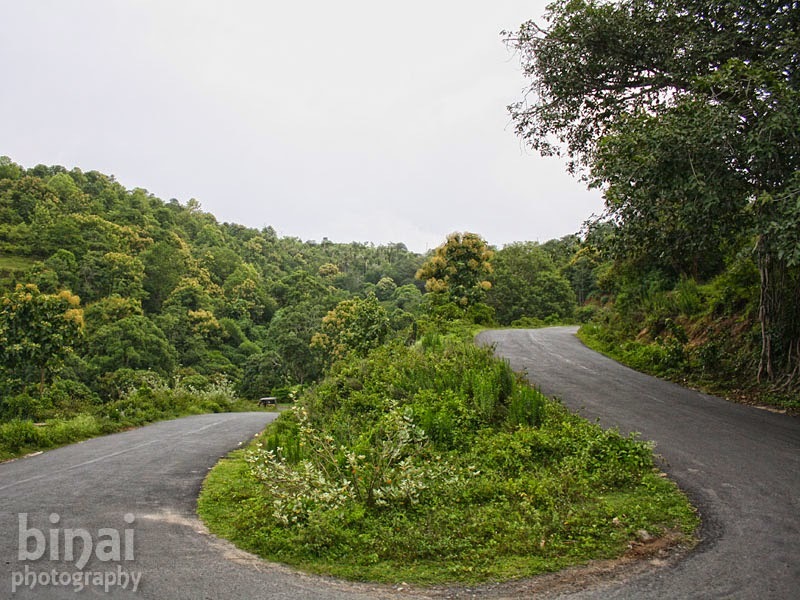 Kallar is the base for this ghat road. 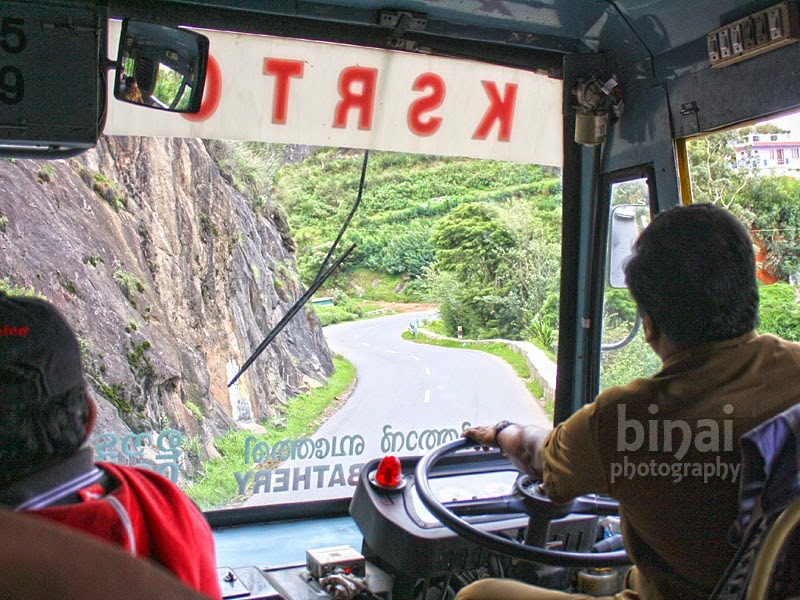 The driver of this bus (Shri Unnikrishnan) has been driving this route regularly for about 3 years - and was quite skilled to handle the ghats with safe ease. 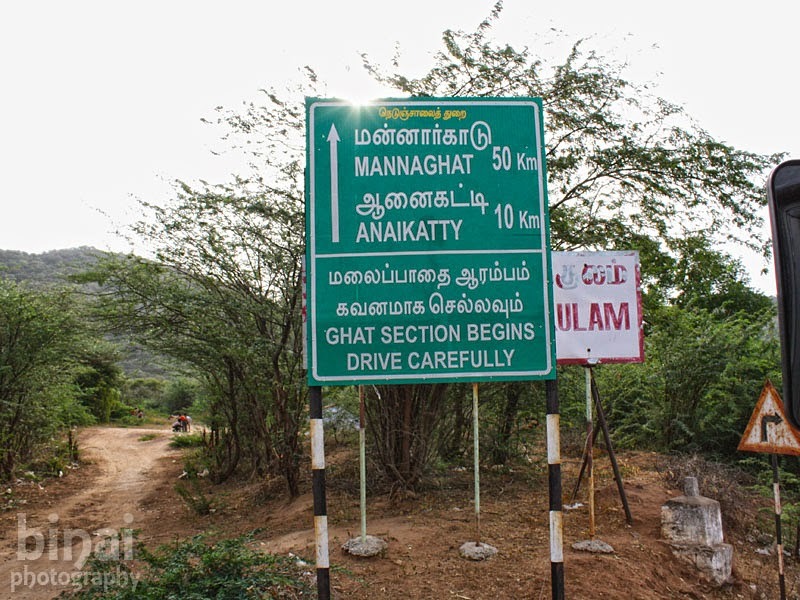 Although the road connects one of the most frequented hill stations in South India, the roads are quite narrow and this results in slow moving traffic. Downhill traffic almost always would have to wait for uphill traffic to clear hairpin bends at most of the turns. 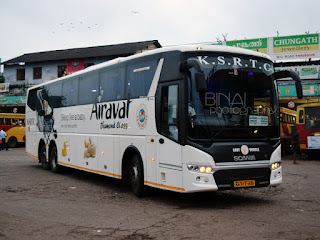 I was sitting at the front of a downhill bus from Ooty after almost two decades - I remember sitting at the front of a Bharathiar Transport Corporation bus (the present day TNSTC - Nilgiris Division) as a kid holding my dad's hand.. This driver rekindled my fond memories of that trip. The downhill trip was quite uneventful - traffic kept us moving slow. Kallar bridge signalled the ends of the ghats - our driver did a brake test soon after the ghats, and then continued towards Mettupalayam. By now it got hotter, and sultry. Some time after crossing Kallar, We stopped for lunch soon after Kallar - the lunch break left me a bit confused if we'd miss our onward connection. But the driver reassured us and confirmed he normally sees our bus only as he passes Karamadai. The lunch break was a routine Veg restaurant that serves hot Tamil Nadu style meals on a Banana Leaf. The lunch break was quite fast, and we got moving in under 25 minutes. We were finally dropped at Mettupalayam BS, at 1425hrs - our gang got off the bus, wished happy journey to Unnikrishnan, as he continued driving the beast to Coimbatore. From Mettupalayam we were taking the KSRTC Ordinary bus to Mannarkad via Anaikketti. We were on the belief that this bus would leave by 1445hrs - but there was no sign of the bus even as the clock ticked past 1455hrs. Sometime around 1500hrs, RRE895 of Mannarkad depot turned up at Mettupalayam BS - the bus was empty when it came in - and we literally mobbed into the bus to reserve our seats. The crew gave a curious and surprised look as we jumped on to seats. The driver asked us not to hurry and told us we'd leave only by 1530hrs! We were stunned to know the departure time, and we then decided to just settle down in the bus. The bus left at 1530hrs as scheduled. There were just a couple more passengers in the bus other than us - the conductor said the bus never gets so many passengers from Mettupalayam anytime. 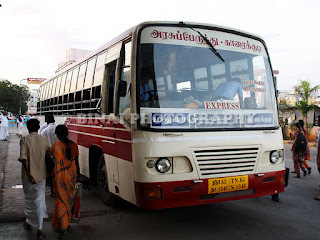 The bus ran through the highway towards Karamadai. After a brief halt at Karamadai bus station, we continued towards Thudiyallur. 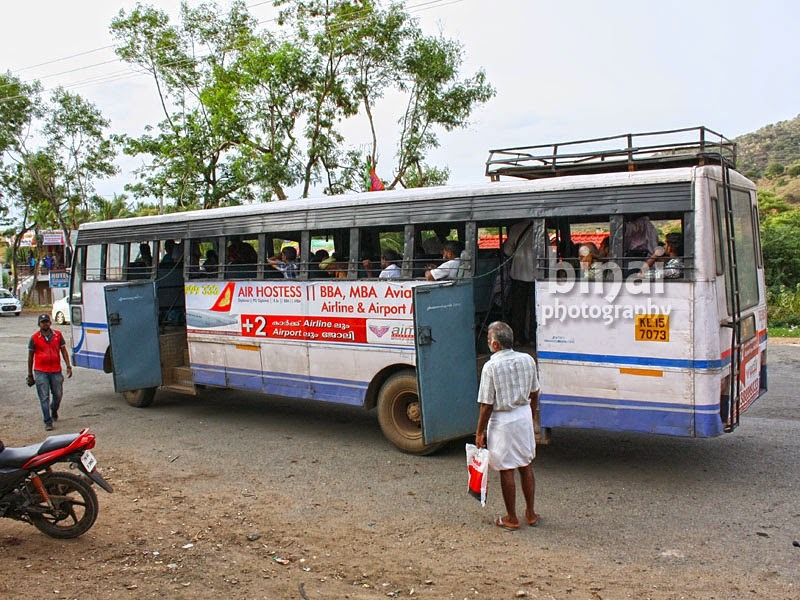 The bus took a fairly long break at Thudiyallur. There was a private TN bus to leave before us, and we were waiting for that bus to take off. The driver waited patiently for the bus to leave - such a patience can never be seen when they drive in Kerala! 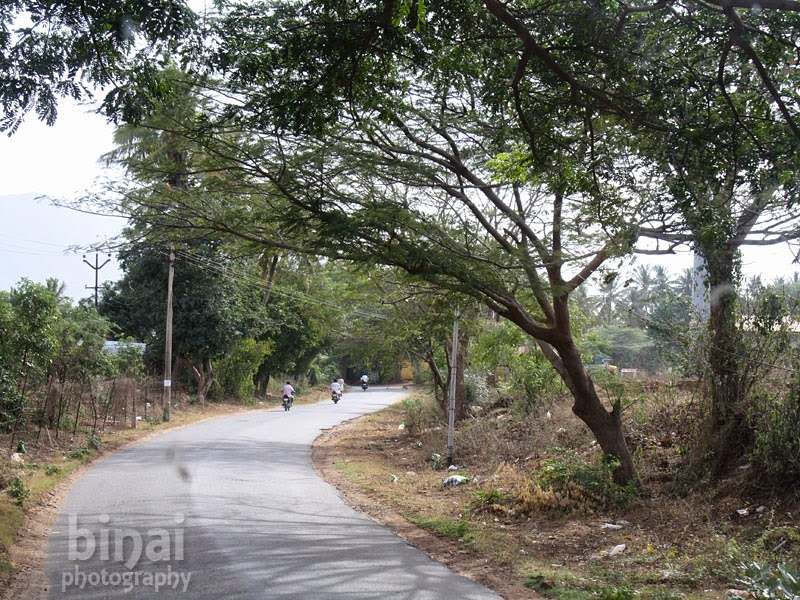 The road after Thudiyallur was very narrow, and often with broken tarmac. The bus was mostly empty till we passed Chinnathadagam. After Chinnathadagam, we stopped by a brick kiln - the bus just filled up here. Filled up would be an understatement. Every bit of space in the bus was occupied - and the conductor had a real tough time finishing ticket sales to all the passengers. Beginning of the ghat section after Chinnathadagam.. Crossing the TN-Kerala border at Anaikkatti..
During our evening tea break.. The bus slowly started ascending a ghat section afterwards. Major portion of the crowd got off very soon, but the seats remained occupied as the bus continued ascending the ghats. The roads passed through uninhabited regions - it was just barren land all around. As we climbed the ghats, some institutions - like a Salim Ali Research centre for Ornithology and a large residential schooling campus appeared in sight. We reached Anaikkatti at around 1730hrs. We dropped passengers and then passed across the border and entered in Kerala. We stopped for a tea break just after crossing the border. The tea break was about 10 minutes long. After the tea break, the bus got a bit emptier, and the driver opened his mind. He was talking about the service, the normal sightings, etc. It was a ghat route ahead - the road was winding, and not in great shape. We passed Agali (the next town after Anakkatty) at around 1820hrs. 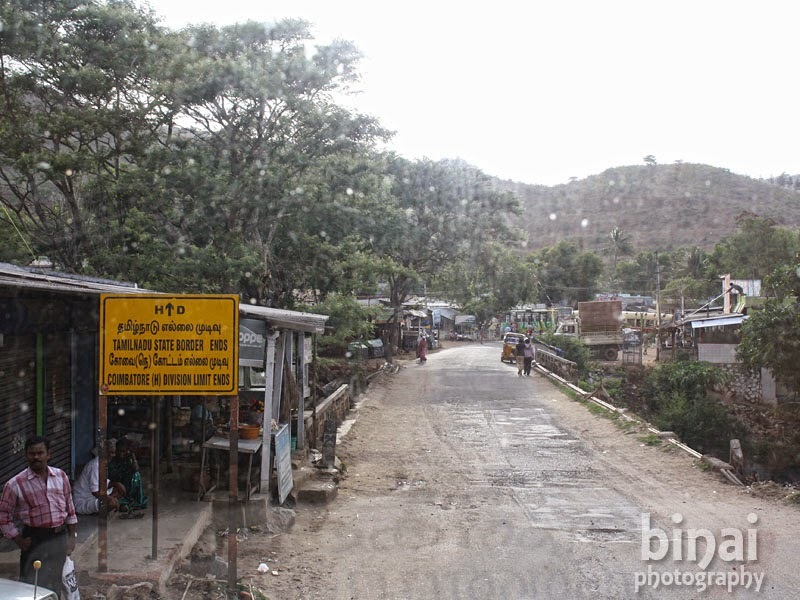 There was another ghat section, with a couple of hair-pin bends after Agali. It got darker as we continued climbing up. Arrival at Attappady was informed by the presence of a lot of wind-mills (Windmills in Attappady are infamous for a land-grabbing scam, and had caused a lot of political turmoil in Kerala). Attappady is famous as a tribal area - and is often used as a colloquial equivalent of a no-man's land. Attappady is purely a tribal settlement, and there were lots of government institutions for the upliftment of tribals in the area. Sometime towards 1900hrs, we stopped for yet another break - this was for the conductor to break his ramadan fast and offer his evening prayers. The break was about 10 minutes long. It got really dark afterwards. We lost all hopes of seeing the silent valley ghats in all its glamour. By now the bus emptied out. The crew were excitied having nuts liks us on board, and they infact got all the seats at the front reserved for us. Both the driver and the conductor were busy talking to us most of the time. It rained a bit through the journey. Soon as we reached Silent Valley, a very dense fog began ascending. 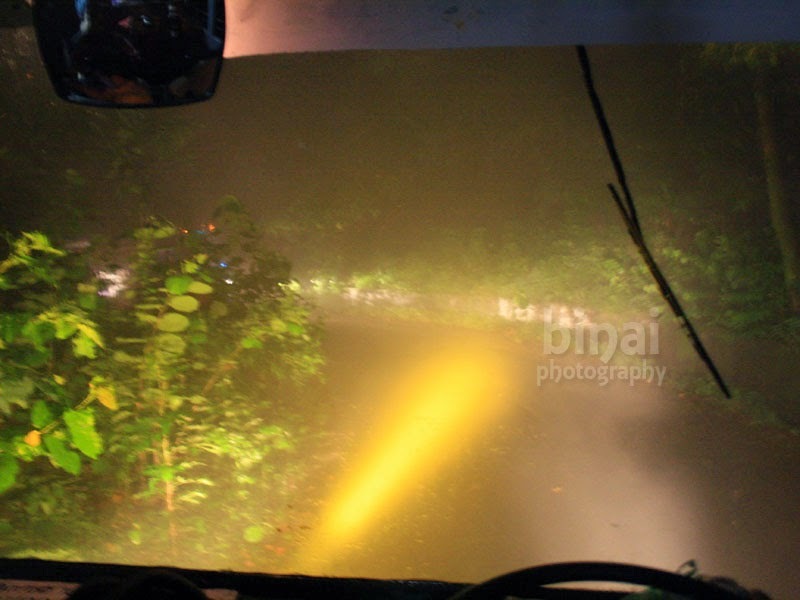 As we entered the ghat section, the visibility dropped down to a few metres. We had a fog lamp - but it did not help matters even a bit. The driver displayed his exemplary skills driving through such difficult situations - with absolutely no visibility, traffic on the road had come to a standstill at some places. The route left me spellbound, and I vow to revisit the section once again. Fog disappeared once we finished descending, and then we picked up speed again. 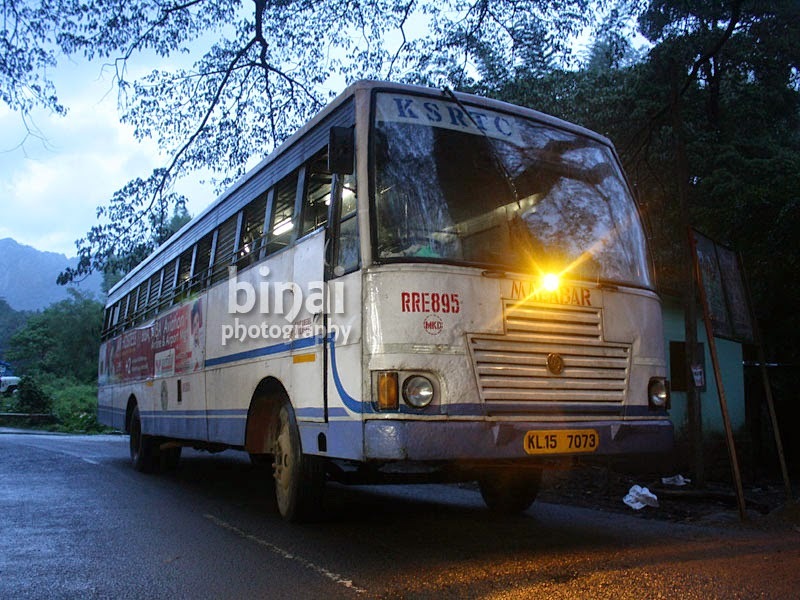 The bus took a refuelling break and finally dropped us at Mannarkkad Municipal bus station sometime around 2030hrs. After bidding adieu to the crew, we headed to a nearby restaurant for dinner and the gang then parted ways. Some of us headed towards Kozhikode while the rest of the gang headed to Palakkad, ending my second group outing with KSRTC fans! Can you please share the timings from Mannarkad to Mettupalayam. 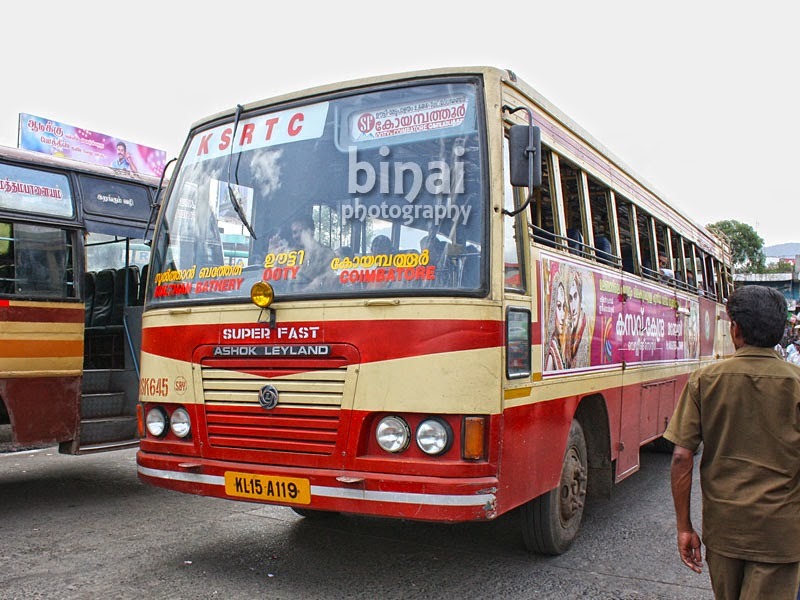 there are two buses running from Mannarkad to Mettpalayam. what is the timings at mannarkkad?? Air India A319 Bengaluru to Hyderabad!